Automatic Emergency Braking (AEB), often referred to simply as automatic braking is a safety standard that literally every safety organization in the US and Canada, including the NHTSA, NTSB, IIHS and the Center for Auto Safety and Transport Canada want installed in all vehicles; the real question is how long will it take. Automakers, although they have made a commitment to implementing AEB see a horizon of 2025, almost a decade from now, whereas most safety experts want this technology yesterday. You may be asking yourself is it that important for auto safety to have AEB installed in cars? Or does the timeline matter, especially if there is agreement to start implementing it? If lives matter, then the answer is an unequivocal yes on both those questions. So you may be asking yourself what is automatic emergency braking and how does it actually work? AEB and forward collision warning (FCW) systems often work in tandem to alert and help prevent crashes by monitoring space in front of a vehicle and then applying brakes in order to avoid a rear end collision with objects in front of your vehicle. AEB systems have been available on vehicles globally since their introduction in Japan in 2007 on Subaru’s EyeSight system. Volvo’s CitySafe AEB system is another such system that was early to market with both of these systems are actually on their third generation in production vehicles currently. They are both a little different in their use of technology and deployment but their general concepts are the same. Essentially there are sensors mounted on front of the vehicle, like two black and white cameras for the EyeSight system that measure contrast differences in the field of view in front of the vehicle. This contrast allows the system to decipher objects in the near-field view and determine if the object is stopped to effect a warning and eventually an automatic application of the brakes by the system. 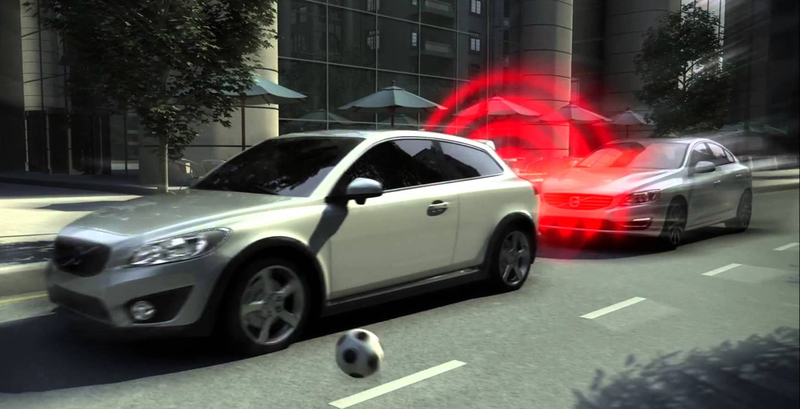 The CitySafe AEB system uses a laser radar system to detect objects in front of the vehicle. The laser pings off objects in front of it and compares them to profiles developed by the system engineers to be recognized as a vehicle, pedestrian, or motorcycle. The system then decides if the object is a danger and alerts the driver and if no actions are taken by the driver starts applying the brakes of the vehicle. The true genius of these systems is their ability to only apply the brakes when there are actual dangers in front of the vehicle. Both systems are developed however in a way that keeps the driver in control of the vehicle. Their intention is still to let the driver drive. Most of these AEB systems are meant to be effective at stopping a vehicle before collision when travelling under 20 miles per hour. At speeds over that amount or for excessive speed in approaching stopped vehicles, the system will generally only mitigate a collision by applying brakes in time to slow the vehicle before impact. Yet, being able to apply brakes before collision is often enough to prevent serious injury, which can make a huge impact. With 1.7 million rear-end crashes a year ending the lives of 200 people, injuring 700,000 others and costing approximately $47 billion in damage and claims, crash avoidance systems have become a safety technology priority for the National Highway Traffic Safety Administration (NHTSA), the National Transportation Safety Board (NTSB) and the Insurance Institute for Highway Safety (IIHS). These organizations monitor, test and evaluate vehicles for their safety and propose changes to laws and to automakers in order to make the roadways a safer place. By installing AEB on every model of car, as rear-end collisions represent 1/3 of all crashes and at least 50% of those are due to driver distraction; at least 30-40 lives per year would be saved with this technology. The fact that the IIHS has revealed that cars that already have AEB have reduced injuries by up to 44% and crash involvement rates by up to 39% they feel this technology could eliminate up to 300,000 injuries a year due to rear end crashes. The real problem with getting AEB into every model in the US right now is politics. In the fall 2015, great fanfare was made about the NHTSA, IIHS and ten major automakers had reached a commitment to install AEB in all future models. What this announcement failed to mention was that this ‘commitment’ was still in its infancy and its particulars were not yet established. In order to make these technologies mandatory for vehicles, the US Congress would need to pass legislation. With the power of the US automakers lobbyists and the congressional process, it was felt that the best way forward would be to enter into a voluntary agreement to get the technology into more vehicles faster. Unfortunately, with most voluntary agreements of this nature, the automakers and the safety experts are at odds on what the actual standard should be and a timeline for implementation. These automakers are negotiating every aspect of the agreement and in the process ensuring that the technology will be a lot less effective and the deadline for implementation is a lot further away than originally intended by the safety organizations. First, the automakers have said that 95% of vehicles could have the technology by 2025, much further away than what the NHTSA or IIHS want. Models that are up for redesign or retirement will not be part of the agreement. The NHTSA is polling members of ten if it would be possible to make a commitment for 2022. The technology itself would also only be mandated to a minimum standard of allowing an AEB of slowing a vehicle by 5 mph before collision. This “dumbing down” of the technology would definitely have huge variances on how many lives would be saved and injuries prevented compared to the initial intention of having an AEB system that could completely stop a vehicle under 20 mph. In the end it looks like the legislative route may have been the better option after all.